The technology that Scinor uses to build membranes gives as a distinct advantage from our competition. With state-of-the-art materials and technology our UF membranes are constructed to give our customers the best service life and cost effective solution. We use state-of-the-art materials and manufacturing techniques to provide affordable and versatile water filtration solutions. Scinor water ultrafiltration membranes can filter high volumes of water with superior efficiency, service life and operational cost. Our proprietary Thermally Induced Phase Separation (TIPS) manufacturing process uses Polyvinylidene Fluoride (PVDF), which allows us to build a better filter that is compatible with more systems. 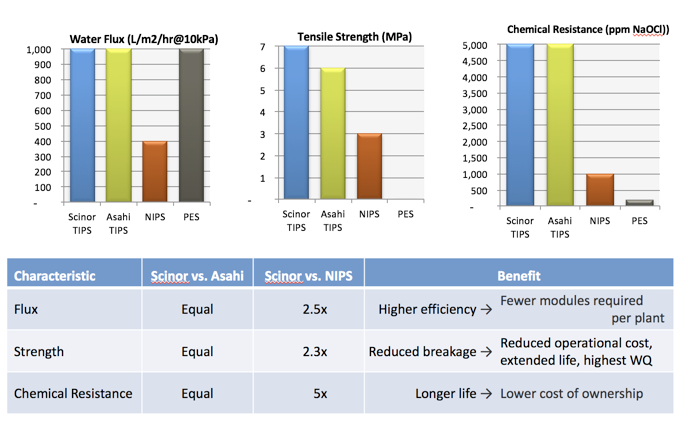 Want to learn more about Scinor’s TIPS membranes? Call us or send us an email to learn more. PVDF membranes are one of the most important differentiators in this dynamic market place. During our unique manufacturing process, phase separation occurs at a high temperature resulting in a high crystalline Polyvinylidene Fluoride (PVFD) structure with a homogeneous sponge-like, interconnected pore structure in our hollow fiber membranes. This results in longer membrane life, better performance, and ultimately a more cost-effective solution for our customers. The versatile compatibility and direct retrofit capability of our PVDF membranes gives our customers many options. We offer replacement modules for all major membrane suppliers.